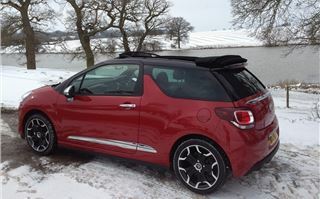 For the UK launch of the DS3 Cabrio, Citroen could not have been less lucky with the weather. At least it wasn’t raining. So, Ranulph Fiennes fingers on the shutter button, it was still possible to get some top-down photos. 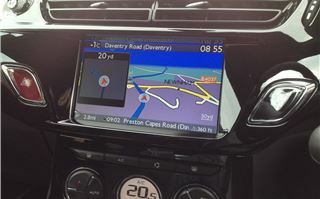 And the timing was useful for me because later that day I was flying to France to drive the new Peugeot 208GTI, which shares a few components. 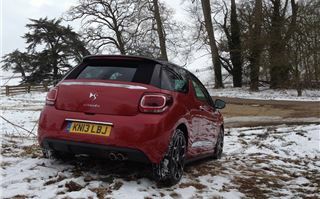 In fact the 1.2 DSign version of the DS Cabrio uses the 208’s new 1.2 litre 82PS 3 cylinder petrol engine, the 1.6 DStyle version has the same 1.6 litre 4 cylinder chain cammer as the 208 (and the MINI), and the 1.6 litre THP 155 I drove is basically a lower powered 208GTI. 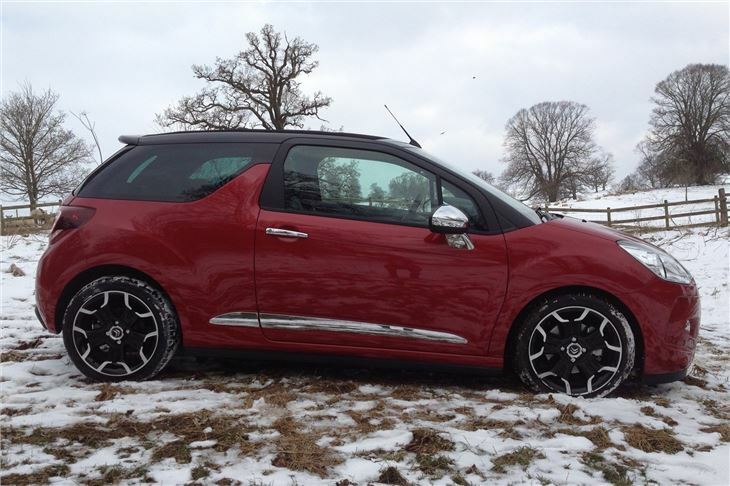 3 years ago I rated the DS3 1.6THP 150 very highly for its outstanding combination of looks, trinketry, power, handling, fuel economy and comfort. 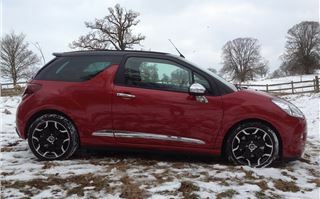 And sure enough the DS3 is now far and away Citroen’s best selling car. So would the FIAT 500C style sliding canvas roof enhance it, or spoil it? 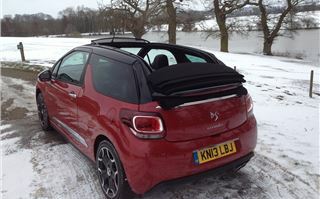 Citroen says the two-stage roof can be opened or closed at any speed up to 75mph, which is handy if the clouds break while you’re on the motorway. From fully open, closing takes 16 seconds. I didn’t verify that because snow was blowing across the road on the day and chunks of ice were flying off the tops of trucks. I can tell you it was nice and snug inside while outside was minus degrees. Citroen was also at pains to point out that, unlike most convertibles, the DS3 comfortably seats five (no hood irons either side to squeeze room out of the back seat). And that it has a decent sized 245 litre, which is a lot bigger than a MINI convertible’s or a FIAT 500C’s. 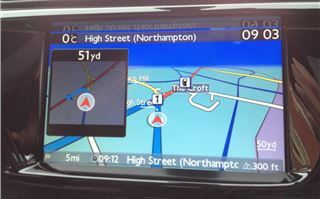 I actually drove two DS3 THP 155 Cabrios: a high spec red one and a standard spec one in Polar white. With 240Nm torque from 1,400rpm they’re good to drive, with neat handling and just enough steering ‘feel’. They’re nothing like as aggressive as the 208GTI or the Fiesta ST. 0-60 in 7.9 v/s 6.5 feels quite a lot slower. 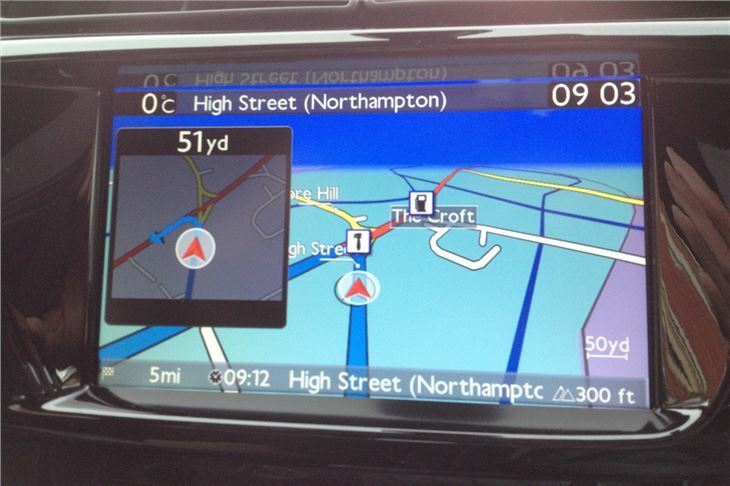 And I didn’t feel as much punch from that 240NM as I did from the Fiesta or 208. 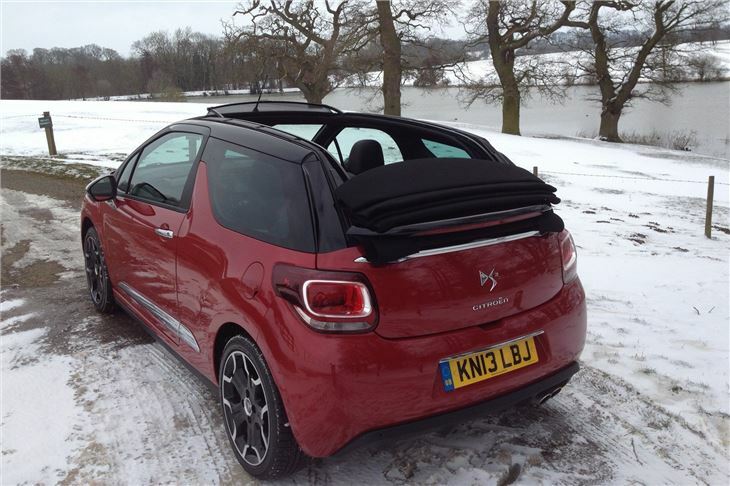 But, of course, the DS3 cabrio is in a similar price bracket. 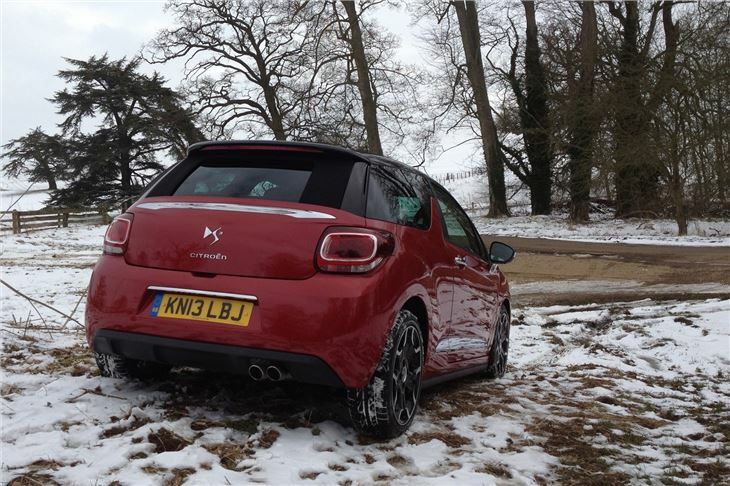 So if a bit of wind in your hair is more important than the extra performance of the 208GTI or Fiesta ST or the RenaultSport Clio for that matter, then Citroen offers you an excellent alternative.